Rather than try to write about every one of the numerous Maryland golf courses here, we'll focus on two of the state's counties, St. Mary's and Charles, which are located in the southeastern section of the state. Although Maryland may not come to mind for many when thinking of the United States' elite golfing destinations, at least when compared with year-round warm weather locations, such as Hawaii, California and Arizona, but the state is blessed with many terrific locations for golf. But for professionals, amateurs, enthusiasts and weekend hackers, Maryland sports a surprising number of marvelous courses. Maryland golf courses come complete with two of the main ingredients that are very hard or even impossible to replicate: geography and climate. The season here is actually longer than some might realize. Maryland is the nation's ninth smallest state in terms of geography. However, within the state's approximately 12,407 square miles, you can experience an amazing array of topography, perfect for golfers who like to challenge themselves by tackling many different types of terrain. Sand dunes sprouting seagrass make up much of Maryland's eastern quadrant; wetland marshes alive with myriad flora and fauna are what you'll find near Chesapeake Bay; and mountains carpeted by evergreen trees can be explored in Maryland's western region. The weather in Maryland is as wide-ranging and variable as the state's eclectic countryside. St. Mary's and Charles counties, like much of the rest of the state, is considered to be part of either a subtropical climate or a subtropical highland zone, meaning snow and chilly temps in the winter, and hot, humid temps with about 35-45 inches of rain on average in the summertime. Altogether, the climate conditions are excellent for nursing all of the lush fairways and lovingly groomed greens of Maryland golf courses. Swan Point Yacht & Country Club offers golfers 18-holes of exquisite golf on the banks of the Potomac River designed by course architect Bob Cupp. Swan Point also boasts a clubhouse, marina on near the 16th hole and a Yacht Club. Call Swan Point at (301) 259-0047. Located at 1015 St. Charles Parkway in the charming small town of White Plains, Maryland, the White Plains Regional Park & Golf Course is an 18-hole, par 70 course, seeded with Bermuda grass and sporting lovingly manicured greens. Some of the amenities you will find here include a professionally staffed pro shop, outings and tournament play opportunities, and a snack bar and grill. For registration and other information, contact the White Plains Golf Course at (301) 645-1300. Hawthorne Country Club offers a private, 18-hole golf course with bent grass greens and Bermuda grass fairways. Membership in the La Plata, Maryland, club also gives you access to a swimming pool, lighted tennis courts and Cindy's at Hawthorne Country Club restaurant and bar. For membership details and other pertinent information, call Pat Terpak at (301) 934-8422, extension 2 or Christy Dickerson at extension 3. Potomac Ridge Golf Links in Waldorf, Maryland, is actually three 9-hole golf courses wrapped into one neat little package. The Meadows, Hollow and Ridge courses offer approximately 3,300 yards of mostly par-3-hole action. Call the Potomac Ridge's Golf Shop at (301) 372-1305 to reserve your tee time. This county-owned and operated 18-hole golf course offers a challenging, nearly 7,000-yard, par-72 course in a scenic, wooded and serene setting. Group and individual play can be arranged. Join in on some league play, regardless of your skill level. For more detailed information contact Wicomico at (301) 884-4601. 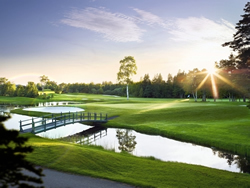 Breton Bay Golf and Country Club is a semi-private, member-owned club. Its amenities include an 18-hole golf course, tennis courts and the Club House/Ironwood Grill. The public has access to green fee play and annual memberships. Check out their website by clicking here for more information.